School is out in West Michigan, and we’ are excited to get outdoors and play! Art and creative actions can happen spontaneously in our summer fun, and can be even better with a little planning and a few materials. 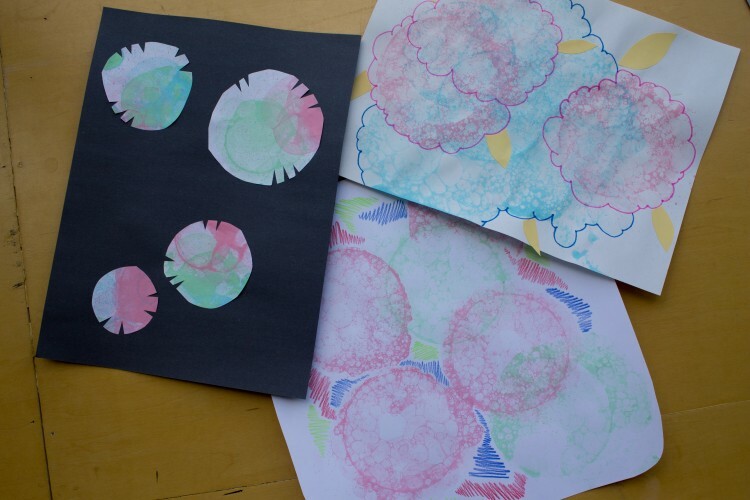 Check out three kid-friendly summer art activities below! Water painting is a great activity for sensory experience and fine motor control, and it has the easiest clean up of any painting activity. Painting with water gives kids the opportunity to create imagery that will fade away in the sun, lowering any pressure on young artists who may love the experience of painting but worry about what their final image will look like. This activity can be wet and wild or soothing and meditative. And all you need is a paintbrush and water. With a tub or cup of water and one or more paint brushes, paint imagery and designs onto an outdoor surface like a wooden deck or sidewalk. This works best when the sun is out and the surfaces are dry. A slab of slate or a chalkboard is a great surface for water painting that can be used indoors or outdoors. Add color and texture with chalk! On your chalkboard or sidewalk, draw and scribble with colorful chalk, then paint with water over it and watch as the chalk disappears. Help kids who are learning to write by painting letters and and numbers, then have them trace over the writing with their paint brushes. Have fun communicating in secret messages, as your writing fades like disappearing ink. 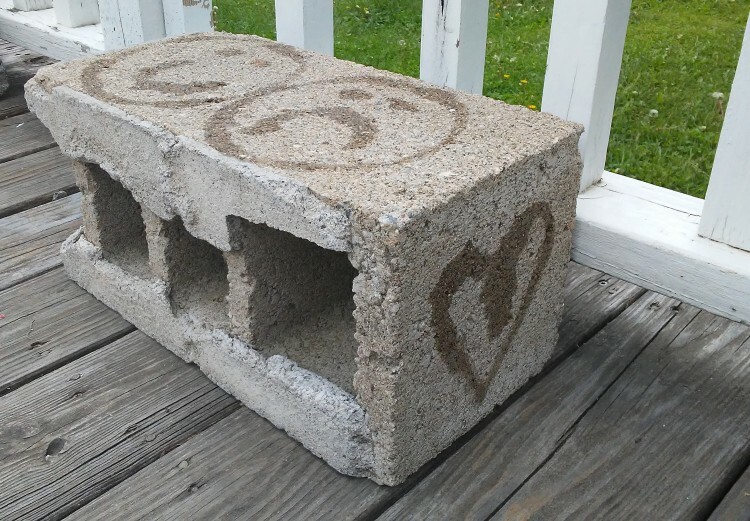 Find 3-dimensional objects to transform with your water painting, like stones, bricks, tree trunks, or concrete blocks. Use water painting to play a game like tic-tac-toe, or illustrate a story while you are telling it to your friends. How many surfaces can you find to paint with water on? What are the surfaces made out of? Porous: describing a material with minute spaces or holes through which liquid or air may pass. Saturated: holding as much water or moisture as can be absorbed; thoroughly soaked. Action Painting: a technique and style of abstract painting in which paint is randomly splashed, thrown, or poured on the canvas. Temporary: lasting, existing, serving, or effective for a time only; not permanent. 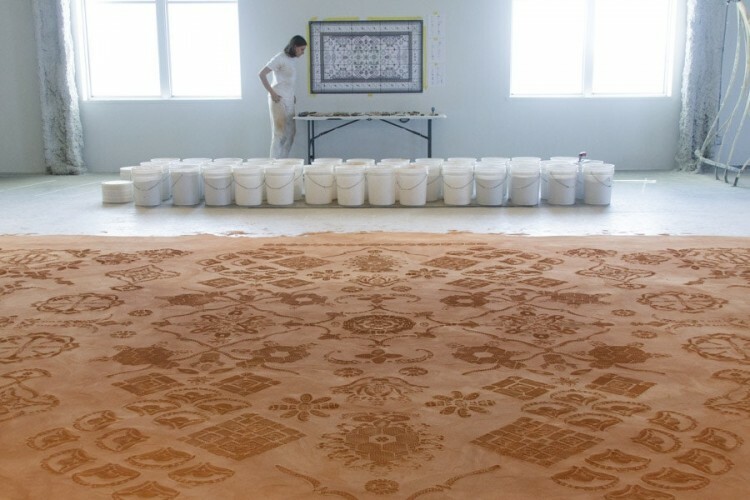 Red Dirt Rug Monument by Rena Detrixhe: This ephemeral carpet made of red dust from Oklahoma and stamps made from shoe soles explores our relationship to nature through decoration and materials. This intricate design can be wiped or blown away, and the dust returned to the earth. Bring art into your nature walk and display the power of the sun with construction paper sun + shade prints. You just need a few simple materials: pick up some colored construction paper at grocery stores and dollar stores if you don’t have any on hand already, and you can find the rest of the supplies in your backyard or on the sidewalk. Gather Your Materials: Take a walk in the park or your neighborhood and collect items from nature, try to find leaves from different types of trees, flowers, grasses or sticks. 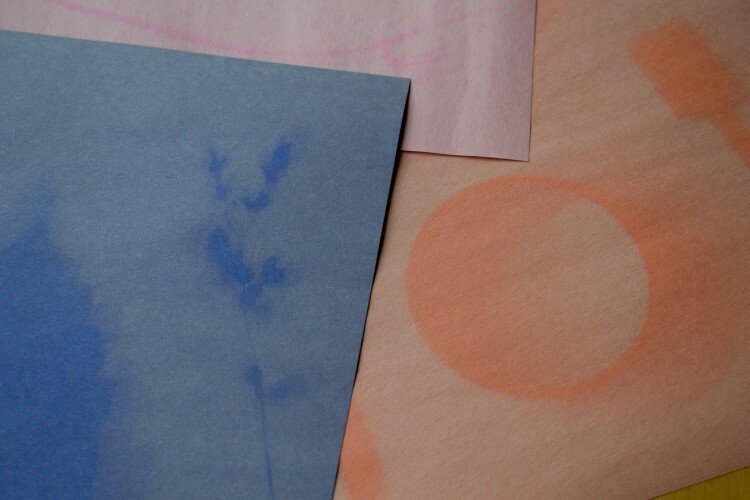 Create Your Artwork: Lay your construction paper on the ground outside or next to a bright window inside, and arrange your collected items out on the paper. To avoid letting the items blow away you might weight them down with stones or set a sheet of plexiglass or clear plastic wrap over them. Let it Set: Leave them in the sun for at least three hours before removing the items to reveal your print. Observe how the ultraviolet rays break down the dye in the paper, fading the parts that were not in the shadow of your items. Mix it Up: Try the same process with cut out paper shapes, plastic letters to write your name, use other found objects and see if your friends can identify the objects by seeing their shadows. Add Line: Try to make a new image by tracing the outlines of your sun prints and coloring them in. Silhouette: the outline or general shape of something, or a dark image outlined against a lighter background. Arrangement: something composed of various ordered parts, set in a visually pleasing way. Photographic Exposure: presenting rays of light to a photosensitive surface. Ultraviolet Light: light waves radiating from the sun that have enough energy to break down the dye in paper or give you a sunburn. Found Object: a natural or manufactured object that is perceived as being aesthetically pleasing and is shown as artwork. What would happen if you removed the objects and left the paper in the sun? Experiment with leaving some prints out for different amounts of time and comparing them. ENMESH by Leroi DeRubertis: This installation was made wire that the artist twisted to make floating drawings of figures, faces, and hands. 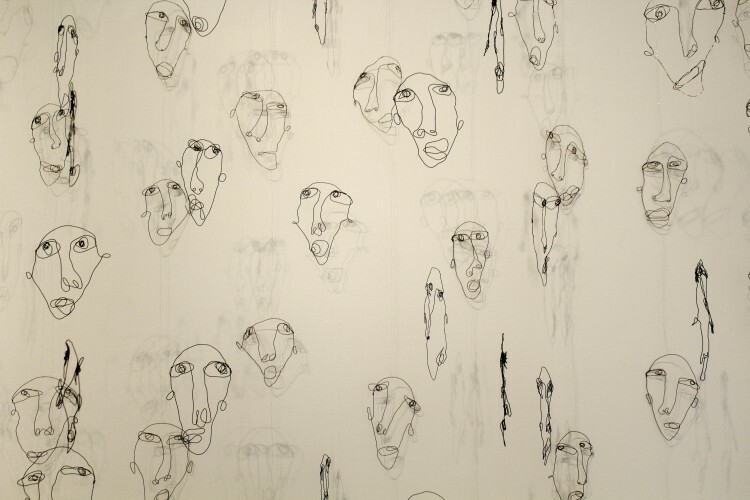 Connected with transparent thread, they floated away from the wall and cast overlapping layers of shadows that changed as viewers moved through the space. Bubble painting is a fun way to combine soap play and artmaking, and is a great exercise in making images by chance. 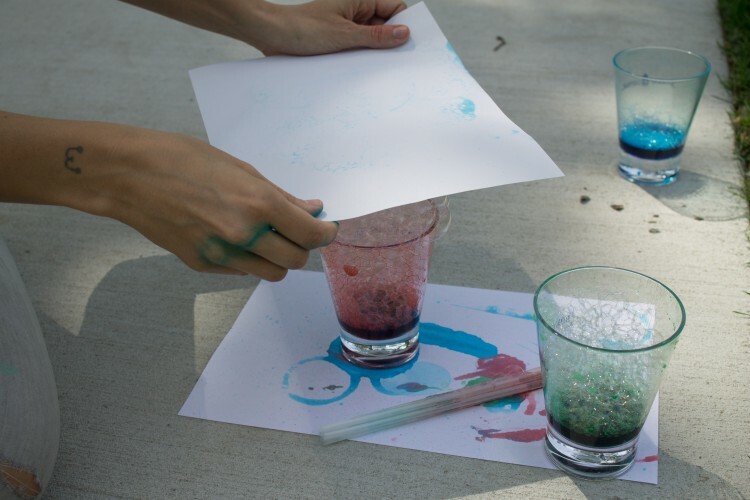 Bubble paintings and prints can be made indoors but are best as an outdoor activity, and it is likely you already have the supplies to do it. 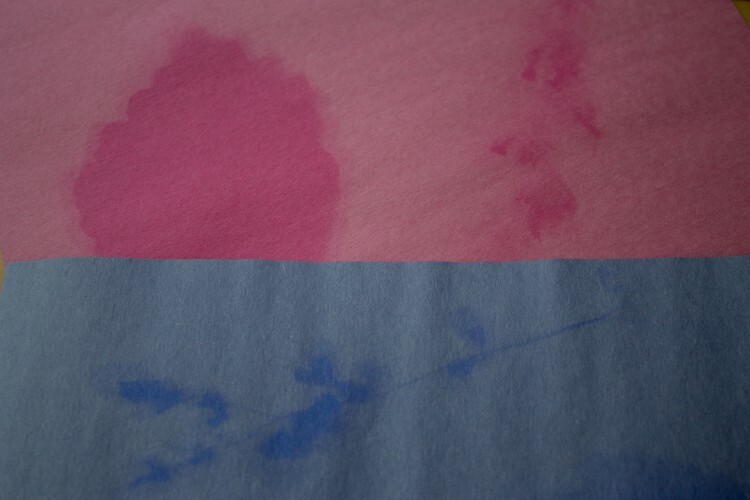 You will need white paper, a bubble blowing solution (make your own with dish soap and water), and a non-toxic coloring like liquid watercolors (link) or food coloring. Make sure to protect your clothing and surfaces from stains because this can get messy! In several small containers, mix different colors with your bubble solution. Use a bubble wand to dip and blow colored bubbles into the air. You can wait for the bubbles to land and pop on your paper, or get up and dance about- following the bubble to catch it with your paper. Another method for making bubbles is to use a straw to blow air into your dish of bubble solution- the colorful soap will bubble up into a mound and you can press your paper on top of the bubble pile to make a print. The third way to form bubbles is to tape together multiple straws (try 6) to dip into the solution and blow bubble clumps, then drop the clumps onto your paper. 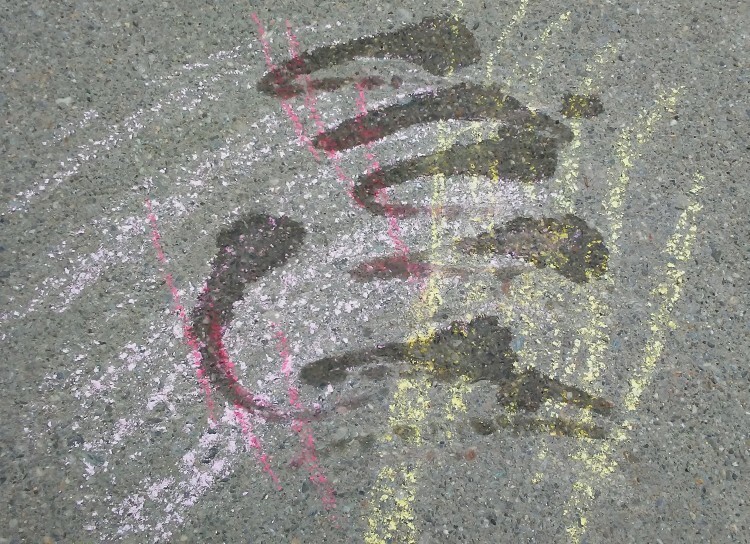 Once your bubble artwork is dry, you can make images out of the designs. Try drawing, painting, or collaging around the bubble shapes to make flowers, funny faces, or whatever you can imagine. 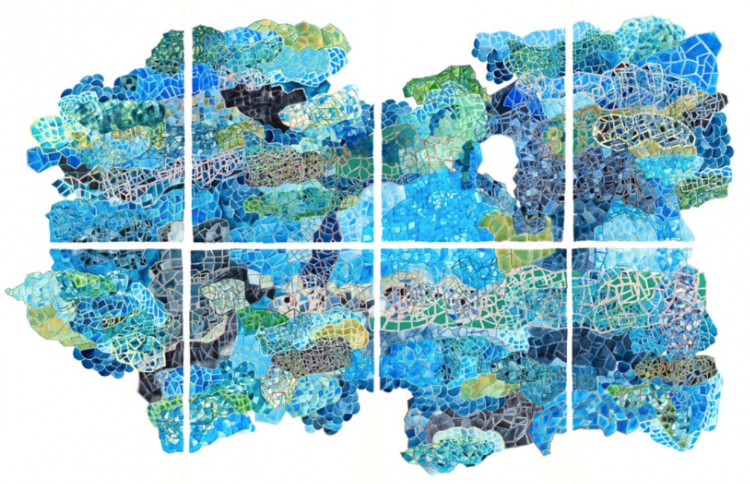 You can even cut up your bubble art and use it to collage on colored paper. What happens when bubbles of different colors overlap? Do you see images in the marks the bubbles have made? Chance: a possibility or probability of anything happening- often a positive outcome of a situation or process that you don’t control. Abstraction: a work of art that does not have representational imagery but may draw connections to images in the viewer’s mind. Monotype: a printmaking process that creates only one print of it’s kind, as opposed to other processes that create multiples. Charted Memories by Keren Kroul is a series of abstract watercolor paintings, inspired by natural elements, that uses rhythmic formations and line and shape repetition.